Quiet private setting among the trees with a queen size bed in the loft. 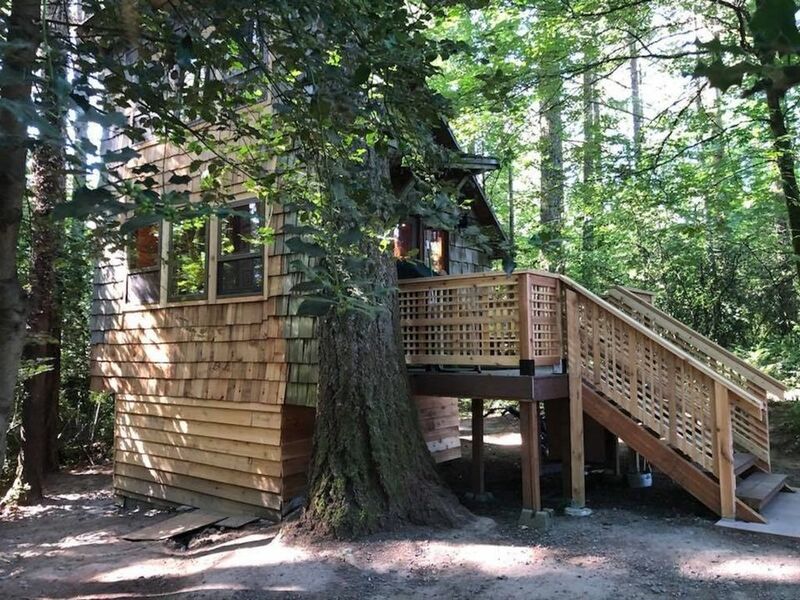 My Tiny Cabin is located on 2.3 forested acres in a rural setting close to Portland and wine country. My home is located on the same property but trees and space in between the two provide privacy. A ladder takes you to the upstairs loft with a queen bed and a skylight for a view of the treetops. A futon that folds into a comfortable full sized bed is located downstairs. The kitchenette provides a microwave, small refrigerator and coffee. Step out to the deck to enjoy your coffee, a glass of wine or cook on the propane grill. I have lived in the Pacific Northwest for most of my life and enjoy all that this area has to offer, from its diverse dining options to world-class wineries. I enjoy shopping the local farmers' markets, volunteering within my community and relaxing on my patio with friends and a glass of wine from a local vineyard. When I first moved here, I enjoyed the feeling of coming home to a forest retreat every day. The trees and the wildlife create a peaceful setting. This cabin provides a tree-house like experience. Some guests have described it as "magical". You will have a beautiful view of the trees and may hear our local owl or see deer passing through. Rural forested setting but near Portland, restaurants and wineries. Futon that opens into a full-size bed with comfortable mattress. A variety of k-cups are available for your use. Sugar, creamer, salt, pepper and microwave popcorn. Kitchenette; no stove or oven. Small table and two chairs (see picture). Books with a focus on the local area. We were so blessed to stay at this cottage. A perfect little place if your visiting the area. Will definitely stay again. Thanks Nancy. The old saying "Big surprises come in small packages" certainly holds true for this tiny cabin. The interior is so well thought out that you don't feel that it's tiny at all. Nancy has thought of every detail. We loved our stay and would recommend it to anyone. The location is just 'out of the way' enough to be a hideaway, but also close to everything you need. The next time I'm in Oregon, I will definitely stay here again. We absolutely LOVED staying at this tiny cabin. It is private, quiet and very cozy. I was a little nervous about having enough space for two people, but we stayed here nearly a week and never felt cramped. The cabin is clean, thoughtfully furnished/decorated for maximum coziness and very comfortable. The bed in the loft is wonderful. The kitchen area is well stocked for grilling needs or eating take-out- there is no stove, but there is a grill and several places to eat nearby. There is also a fridge and microwave. This is by far my favorite VRBO rental thus far and I would stay here without question again when visiting Portland. I cannot stress how much we enjoyed it, the cabin really felt like home and the owners are very pleasant, eager to help if needed and easy to work with. Very comfortable and warm, unbearably cute, well-equipped with all the necessities such as nice towels, blankets, kitchen tools, coffee, toiletries, tissues. Comfy and cozy bed. Hot shower. Selection of board games and Portland-related reading. Private enough but definitely not deep woods. Very very quiet area. Owls hoot in the dark night. About 25 mins from Portland proper, easy drive. Will come back for sure. Great little retreat and gracious host. Perfect. Nancy was a great host. The cabin had everything we needed, it was clean, well decorated and private. I would highly recommend Nancy's property for a weekend get away not far from Portland. My husband and I spent the day exploring and it was so nice to come "home" to this perfect little cabin to rest and relax.